We use the best lens materials in the world – techlite glass for optical precision and carbonic for impact resistance. We preciselst polarizeter our lenses with multi-layer mirror, Anti-Reective (A/R), anti-scratch, and hydroleophobic lens coatings. the end result is an artfully crafted lens that preserves color perception and delivers optimized optical clarity and precision in all environments. the base curve is the radius of the sphere measured from the back of the lens. smith features styles with 6, 8, and 9 base lens curvature. Models that include 6 base tend to be morat relative to your face. While 9 base styles provide the maximum amount of wrap around your face. Objects in lens are exactly the same as they appear.” When light passes through a medium it refracts, i.e. changes course. if left uncorrected, this refraction can cause visual distortion and eye fatigue. smith’s tapered lens technology straightens out the incoming light rays by progressively tapering the lens from the optical center toward the peripheral view. What this means for you is that you see with 100% accuracy and maximum comfort. 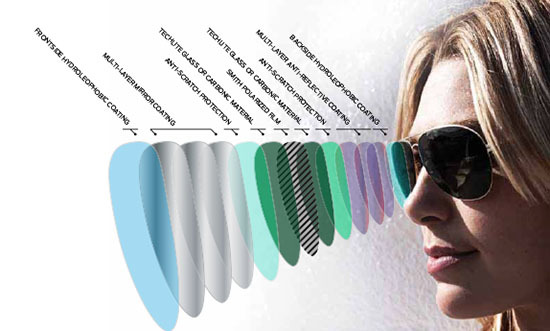 With smith Polarchromic we combine the glare-free benes of advanced polarization with UV sensitive, self-tint-adjusting photochromic technology to bring you the most advanced sunglass lenses we have ever created. how do we do it? Precise amounts of silver halide crystals are infused into the glass lens material during their creation. these microscopic crystals automatically change orientation in response to UV light which results in a shift in tint either increasing or decreasing Visible light transmission (Vlt),our lens in response to ambient light conditions as they change throughout the day. the result? You get a lens ers crisp optics and soothing light levels at all hours, allowing you to focus on what matters most from dawn to dusk.